I went to my JoAnn’s around 110:00AM and there wasn’t even one skein of Thick and Quick chenille yarn left. I do wonder if it is being discontinued. I didn’t think I should drive to any of the other JoAnn’s stores to see if they had any, since it seemed unlikely. So I decided just to go home and work on one of my already started projects. On the way home I passed the new Bristol Farms grocery. You should see the strip mall it is in. It has a small lake with sculptures of sailboats and seagulls in flight. It has a bridge over it too. The housing development across the street has a lighthouse watching over another lake. Really pretty, but we live in the desert and have water shortages. Well anyway I stopped and bought some cupcakes to take home and surprise the guys. I tried to take a nice photo but I need to practice. There are no do-overs when the photo subject is food that disappears faster than it takes to snap a picture. 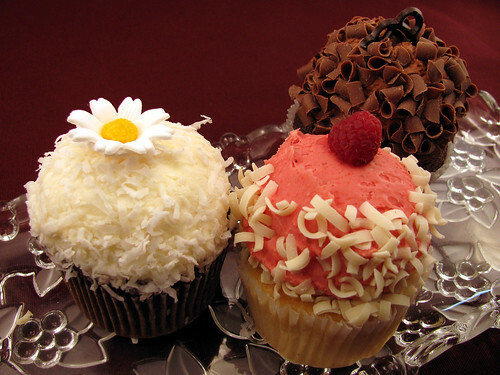 They are coconut cream, lemon raspberry, and double chocolate. This entry was posted on Monday, January 12th, 2009 at 3:00 am and is filed under Life. Tagged: Life. You can feed this entry. You can leave a response, or trackback from your own site.